Are you looking for a Dutch translation services provider for your English to Dutch and Dutch to English translation needs? Wolfestone has the experience and quality to achieve your communication objectives. All our Dutch speaking translators and interpreters are carefully vetted, have at least five years’ experience in translation and, where relevant, have sector specific academic qualifications. We offer our Dutch translation services for legal documents, websites, financial reports and a lot more. Click on the icons if you want to find out more about the types of translations we support. Why choose Wolfestone as your Dutch Translation Services Provider? 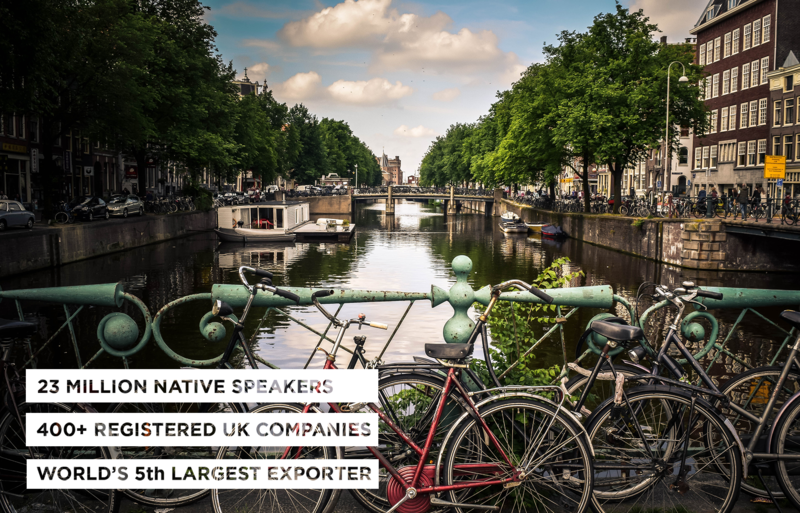 For companies ranging from SMEs to Corporates, Wolfestone undertakes hundreds of Dutch language projects every year. Our linguists can also advise you on words that are unique to Flemish, the Dutch language as spoken in Flanders, the northern part of Belgium. Last year we worked with a successful British retailer on a Transcreation and Multilingual SEO project. The company’s top 20 search term keywords are now each ranking in a top 3 position, and the retailer has opened their third shop in the Netherlands. Dutch has around 23 million native speakers with another 4 million being able to speak it as a second or foreign language. It is an official language in the Netherlands, Suriname, Aruba, Belgium, Curacao, Sint Maarten and the Dutch Antilles. It is said to be one of the easiest language for English speakers to learn as it comes from the West Germanic language tree, as does English and German. It’s also the root of the Afrikaans language in South Africa and they even share mutual intelligibility today. The Netherlands has a population of around 17 million and is the most densely populated country in the European Union. It is the world’s 5th largest exporter and home to many global companies including Unilever, Philips and Heineken. Its largest trading partner is Germany although trade with the UK, Belgium and France is also very common for the Dutch. The Netherlands tend to be an early adopter of new technology and are one of the world’s most open economies. This makes the country very attractive for investors, with over 400 British companies making themselves at home in the Netherlands. Contact us for more information on our Dutch translation services.